Yes, I know. We’ve all heard more than enough chatter about the New York City Marathon. So feel free to skip this blog post. Just think of it as stumbling upon a diary that maybe you aren’t supposed to read. But if curiousity gets the better of you, come back later and take a peek when nobody’s looking. Friday night, November 2nd, 5:25 pm. I am at the expo in a uniquely long line to get my bib and goody bag. 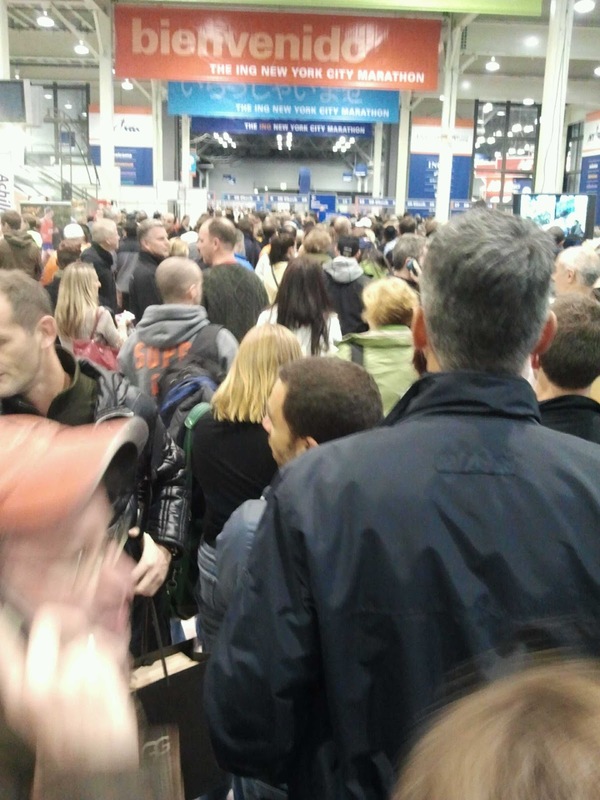 The line isn't moving, and in front of me I hear someone talking about running the Richmond marathon. Next to me a woman is on her ipad looking at routes to drive to New Hampshire to run a marathon. Minutes later I finally hear the murmurs that the marathon is canceled. My jaw drops. I don’t believe it. The line to get into the expo, just before I learned of the cancellation. Like the rest of those in line, I relied on my smartphone to view twitter to see the news. (They didn't officially announce it at the expo until 30 minutes later, but staff shook their head with a somber nod when approached). Canceled? Canceled! After a week of deliberating and debating and then deciding to put it on, and the easy $2,000 I had put into this whole weekend, canceled now? Really? Right call, bad time. Good money after bad money. And I’m all ‘marathoned’ up? What now? What to do with this build up of running mojo? Runners are all around me, and I was surprised by the lack of intensity in feeling. It was disappointment, slightly shocking, but it was an “Awww, Dammn it,” response, not a “F**k that darn mayor and NY Road Runners, and the Wile E. Coyote they came with" feeling. My wife remarked how any other group would riot, but not runners. Imagine canceling a rock concert. Or god forbid, a New York Giants game. Sure, you’re bound to hear whining, but I did not hear self-centered remarks from any of the many, many, many runners I spoke with (yeah, I randomly just chat with folks.) 100% agreed it was a decision that came too late, but I didn’t hear from a single soul that it was a bad one. Of course, people write and feel things they don’t say, but the mood and tone was an understanding one. Strangest thing I heard was one runner, who said “now we can donate the unused Gu to the hungry”, which I have to feel is the Marathoners version of “let them eat cake”. Media had started to converge on the marathon expo, which had become an eerie place, and I grabbed my shirt and began the defeated march out of the expo. Unused merchandise, which 20 minutes ago I would have swooped up, looked kinda sad and untouched sitting there. Like a pile of misfit toys. All week I’ve been leaning towards thinking the event should be canceled, but as it appeared the marathon was on, my question the last few days had become, should I run or not? Is it the right thing to do? I have always felt I make fairly, yet far from perfect, socially responsible choices. I am quite socio-economically aware of things, have worked in social work for 20 years, but by running the marathon, was I being an elitist? Was I now part of the 1%, ready to have eggs thrown at me, (as was threatened) and who knows what else as I forced a run through some of the ravaged areas of New York? Was this a form of self-centeredness run riot just to get my running high-on? As the weekend went on, I thought of what it was going to feel like on Staten Island marathon morning with all the wreckage we’ve read about, and for some reason, those two children who were found drowned after being pulled away from their family especially stuck in my mind. In mid-town Manhattan, I saw mile long gas lines, heard from hotel and retail workers who had lost power, but it was business as usual. “I survived Sandy” t-shirts were a big sidewalk vendor item. Meb, who’s peaceful smile and feet full of skechers that could peace out any upset soul, put it great as he said: "Any inconveniences the cancellation causes for me or the thousands of runners who trained and traveled for this race pales in comparison to the challenges faced by people in NYC and its vicinity in the aftermath of Sandy,"
As I walked out of the expo, as if to further my level of runners ‘inconvenience’ compared to tragedy, I got a call from Delta airlines. They had found my lost luggage. Yep, lost luggage from Detroit to New York. Sweet, some good news, it was on its way. “We can have your luggage to you by Monday since there is no gas for the vans.” Not so sweet. Like the incredibly smart, well-seasoned, and Olympian-caliber elite runner I am, I had packed my essential running clothes in my carry-on. However, extra underwear, clothes, as well as most of my wife's and daughter's things were in the lost luggage. Yep, my incredibly dedicated support crew were now camping in New York. The non-profit I was running for, The Covenant House, had their dinner that night, and I dined with 50 other Home Team fund-rasing members. It was a great experience, since it really put the lack of running in perspective. Covenant House is home for teens and young adults, and has facilities in most major cities, and some of their facilities were damaged by Sandy to the point they needed to relocate the residents. The $100,000 we raised was surely going to be needed. At the dinner, we heard a first hand account from one of their ‘kids’ (they call them all their ‘kids’, as if they are all family) who grew up in an alcoholic family, had two of her friends murdered in front of her, and who is now a Covenant house resident. She is working 3 jobs and is getting a college degree to work to stop the violence on the streets. My tears, usually reserved for the end of the marathon, were now present at this meeting in a crowded NY restaurant. If we knew of all the tragedies around us, all the time, could we ever run again? These are the tragedies we run through every day, with every marathon in every city. Is this the beginning of a huge, conscious-shifting trend? ~ Where we all start to voice our concerns that resources are being diverted to the elite (in this case, by defacto, the marathoners) away from those who have been hit by tragedy for no fault of their own? Let’s hope so, but catering to those who have is as much the American way as is coming together in valiant, heroic efforts to aid those in need. It’s the Yin Yang of America, and this would have been highlighted by plopping a huge, runners village in the middle of a disaster area on Staten Island. Okay, sentimental junk, but go read the original press release and tell me which one you’d rather recieve. My actual running, outside of these implications, was already a bit slammed by a painful injury that stopped short the only two runs I had over the 15 days before marathon day. But I felt bad for the many first time marathoners I spoke with who were never going to feel the triumph of finishing a marathon after all their training. There are stories of triumphs that need to be told. Next to me at the Covenant House dinner sat a couple who had raised 5,000 dollars for covenant house, and had mentored one of their residents for years. The wife was a runner who was hit by a car a year ago, had spent 2 months in a wheelchair, was told it would be too painful to even walk and much less to run again. But she had pushed herself, started running, and trained all year. This was her sign of a comeback. I felt bad for the runners from Alaska, from France, from South Africa, all of who had a resilient shrug when discussing the canceled event. Yes, I had traveled as well, but had it been canceled, I would have come anyways, since it was a family trip. And with the cancellation, I walked even more of the city than I would have otherwise and saw too many sites to mention. New York is so huge it makes Chicago look like a suburb, and I’m sure I walked 26.2 miles during my weekend. Still I had to see what running would be like, so I woke up at 5:15 on marathon morning, and was out the door running towards Central Park to meet the sunrise. I ran through the near empty streets feeling very much alive. Man did I need this run, and my pace was slow but my legs were responsive, and I was infused with the power of running to transcend anything earthly. What was going to become of all the spiritual, emotional, and physical build-up of 40,000 runners that was unable to be released? Well, I saw part of what would happen when I arrived at Central Park. Thousands and thousands of runners began to gather, running the last miles of the marathon course in multiple loops. Countries of Denmark, Sweden, France, South Africa, ran with their flags in the air, even some spectators cheered, and the joy of running was like a loud song in the air. 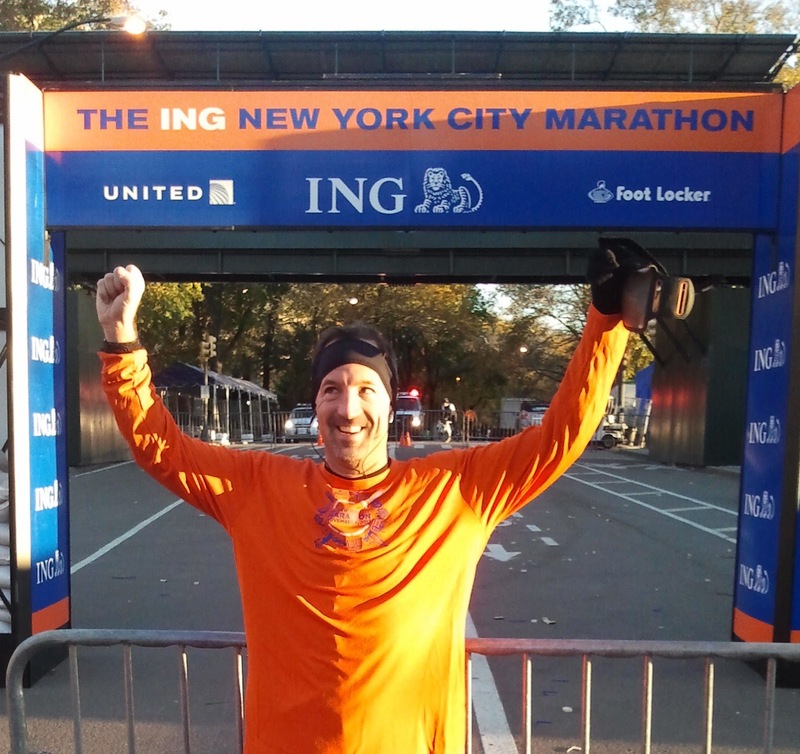 I have no marathon to remember, but I do have that incredible Central Park run with easily 10,000 other runners that I will never forget. It reminded me of the ‘Who’s at “Whoville” on Christmas morning, when the Grinch Tried to steal Christmas, but realized he couldn’t take away the spirit. Were singing! Without any medals at all! Not much was said to each other but not much needed to be said. Miles of training from across the globe converged in a collective running unconsciousness. I ran with Sweden for a mile, yelled “Go Zetterberg” (yes, a Detroit Red Wings reference) and stopped at the marathon finish which, at this point, was gated off but runners were swapping cameras and taking pictures. The runner who I exchanged cameras with did not speak English, but he did speak Runner, and we both took shots at the finish line with a nod and a smile and were back off to run the course. I put in 16 miles, had to do some walking beaks as my injury flared up, but was fully confident I would have gotten in my 26.2 had the marathon been run. I returned to my hotel which had power. Loved ones and a bagel with cream cheese were waiting. I had all that needed, maybe not all that I wanted, but the rest is just an inconvenience. So, 42,000 runners survived, all probably feeling this anti-climatic tingle in their gut, but we will go on with our lives while New York tries to recover. I learned that running shorts can substitute for underwear in the event your luggage is lost, that there is one exception where you can wear a racing event shirt without having run the event, and that the human collective is both an imperfectly insane yet incredibly noble thing. See you in Staten Island in 2013. God, Nature, Bloomberg, and the New York Road Runners willing. Great post Mark. There's always next year. I should have had you get me a shirt. Those thing might go for something some day. Ha! If you can get your hands on an actual finishers Medal, that would be a rare artifact. Awesome, Mark! Loved reading this and love the idea of Sandy bringing about a greater sense of consciousness among runners of those we run by. How many times do we run in a race through a "sketchy" area or see homeless people or on and on. I love that you made the best of your situation and didn't bemoan any of your relatively tiny misfortunes. Thanks for sharing your experience and I hope you have the most amazing comeback race report (for both the race and post-injury you) ever! The heart of Recovery. The NYC 2012 marathon being cancelled will never be forgotten. But the recovery was the NYC 2012 marathon and belongs to Central Park (the heart of NYC) and 10,000 runners who ran marathon morning from across the globe; and you shared it. Cherish it! BRAVO! Those memories will live in your heart forever and far exceed any PR! Thanks for the great questions. I do understand that whole 'thumbing their nose' thing, but the tone in the park was not at all a 'screw them' kind of thing. It was in a section of the city closed to traffic on the weekend, was not suported by any aid stations, medical staff, or city resources beyond a normal day at the park. There was a few downed trees in the area, but minimal effects of the storm. Similar to your point, however, my dillema and question I asked myself was; If I felt the marathon should be cancelled, why was it okay for me to run the event, just because they were having it as planned? was it because I was a small part of the mass? Then isn't that what a mob is? It never felt fully right, and my question and concern was 'would it feel even more wrong during the race, or would my fears prove unfounded and the event be part of the city's recovery.' After raising money for the homeless, and having many sponsors donate money in support of my dedication to train and then run the miles, could I come back to them and say "I chose not to run, even though the race was on."? This whole thing made runners and marathoners become more socially and politically aware of their sport, which is typically outside of this arena. Great post of your time and experience in NYC. Like you, I am a professional therapist (psychologist); like you, I have also "chased the Unicorn", running Boston in 2009 and 2010 (where we might have clunked elbows at some point); and like you, I registered in the NYCM this year—although I did not succeed, and instead ran the Green Mountain Marathon in Vermont on Oct. 14. Thanks for your blog! I would definitely have preferred your press release to the one I read in the papers. And congrats on the upbeat and positive experience you made of your time in NYC despite everything. Best of success in running the marathon next year! P.S. Forwarded this to my brother Greg who just ran his first 5k with the goal of beginning to whip his 46-year old body into shape. Great Post. I too ran for the Covenant House and raised close to $4000. I was 10 minutes from boarding my plan and found out it was canceled. I elected to have my ticket transfered to the following weekend and joined 800 other NYC marathon runners as we raced in the Richmond VA marathon. 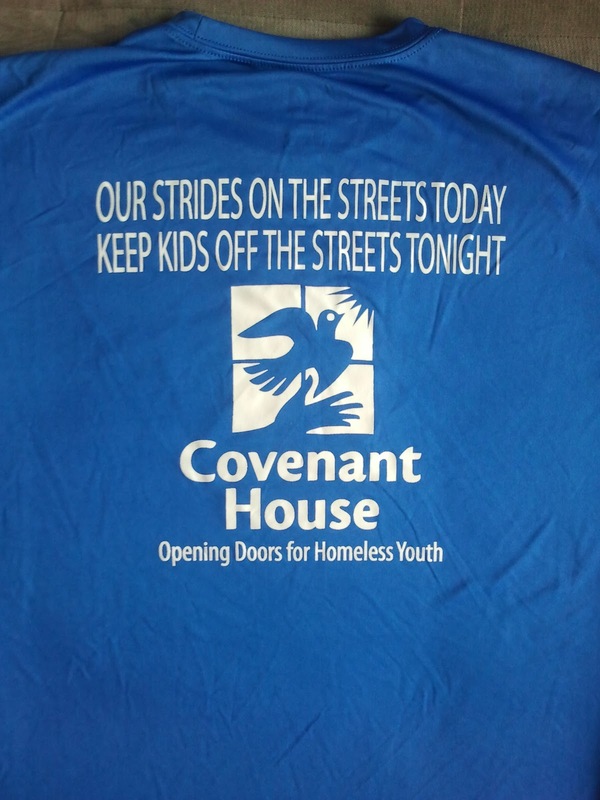 I will forever run for the Covenant House and they need us more than ever. Blessings to you and your feet that they carry you many more miles! cool! 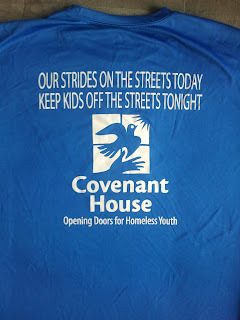 We may have met had you gone to the Friday night Covenant House dinner. 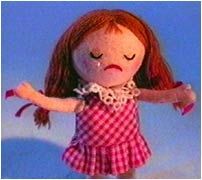 I just went to the candlelight vigil for the Michigan Covenant House.